If you've been looking for a Flat Shank Training Bit with Copper Roller you came to the right place. This Training Bit happens to be one of our best sellers due the it's impeccable craftsmanship and affordable pricing. All the horse training bits that we offer are high-quality horse accessories. 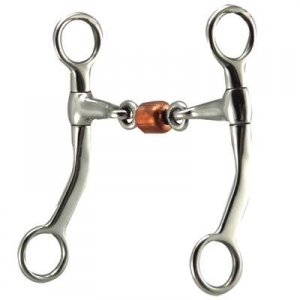 This Flat Shank Training Bit we have to offer comes with copper rollers which help with the horses salivation. The measurements of this horse bit is 13.5mm mouth and 3 3/4'' shanks. Get Flat Shank Training Bits today at Horse Tack Now, Your number one source for bits with shanks and thousands of other Horse Tack products.